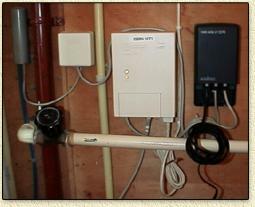 In this brief article I will try to explain to you how to setup an ADSL connection at home using the Do-it-yourself kit. It's easy and will save you some bucks. In this situation: I used the KPN MXStream-Basic version for ISDN using Ethernet - the USB works in a similar fashion, with the exception that the wire form the ADSL modem to your PC is in fact an USB cable. The PSTN (Analog) variant setup can be found here. What can we find in the Do-it-yourself-kit? Personally I would have rather choose myself which modem I want to use, so I can use hardware from Ericsson, Zyxel and Fritz instead - but hey, it works OK. Locate the KPN main Phone-wire. cable from the old phone connector (B) to the NT1-box. Disconnect the cable from the old phone connector (B) - you might not have one of these. Also remove all cables from the NT1-box. Powersupply of the NT1-box can stay connected - if used at all. Note: you could have an older NT1-box, these boxes do not have a connector but use bare wires. Remember where the red and blue wire where connected, you will need them again at connection 3. Open the old analog phone connector (this once was used for analog lines) indicated as (B) photo above Disconnect the cable from the socket and remove the socket entirely. Now open the ISRA-mount box carefully (displayed on the left). Move the wire you just disconnected underneath the jack of the ISRA-mount box. 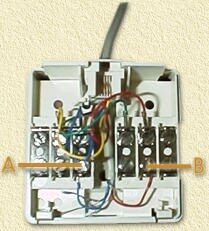 Connect the red wire to (B) and the blue wire to (A) as indicated in the picture on the right. Tip: there are some wires already in place, match the new red and blue wire with the ones already in place. After connecting the cables you can mount the ISRA-mount box to the wall an close it. Connection 2 (BLUE): Connect mount box (ISRA) to the splitter. Use the supplied phone-wires (indicated in the content picture as I/J). Connect the cable to the ISRA box, and the middle connector of the splitter. Connection 3 (ORANGE): Connect splitter to NT1. Use a similar cable as in connection 1 (content picture indicated as I/J) and click on of the connectors in the most right jack of the splitter (a phone icon is to be found there). Connect the other end of this cable to the NT1-box. Note: you might have an older NT1-box. You will need to cut the cable you just used on the side of the NT1-box and connect the blue and red wire to the connections in the NT1-box previously used. The LED "Line" of the NT1-box will glow now. You can now mount the splitter to the wall - do not close it yet. Connection 4 (PURPLE): Reconnect the ISDN phones. Reconnect the ISDN cable as it was connected before and try a phone - see if it works all right. Connection 5 (RED): Connecting the ADSL modem to the splitter. Now use the black cable (see: content picture indicated as cable L) to connect the modem to the splitter. Connect one end to the left most jack of the splitter and the other end into the right most jack on the back of the ADSL modem. Connection 6 (YELLOW): Connect modem to computer. 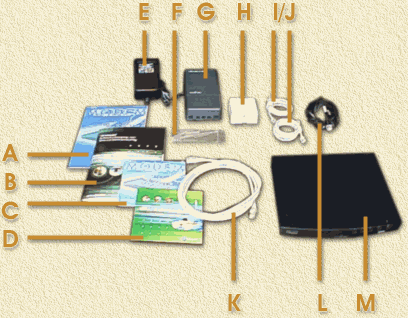 Use the network-cable that came with the kit (indicated in the content-picture as cable K) to connect the modem to your computer. Connect the cable to connector C of the modem (see picture above) and the UTP network-card connector of your PC. Note: Even if you plan to use several other computer as well, TEST YOUR CONNECTION WITH 1 COMPUTER FIRST! Connect powersupply to the modem. First start ... does it work? We are about to check the connection between ADSL and your computer. Switch the modem ON. A red LED will start to glow/blink, eventually it will turn orange and finally green. Next to this LED an additional green LED will start to glow. If this is OK the your connection to KPN ADSL is OK.
Now boot your PC. As soon as Windows is up and running, you will see a green light on the back of the modem: your network-connection is working OK too. You're now ready to start to setup your Internet connection over ADSL. The required setup is very specific for your ISP, so please consult their guide for details. Also: you might consider the Alcatal Hack. and take a look at the meaning of the indicators on the modem, they help you solve problems (sometimes).